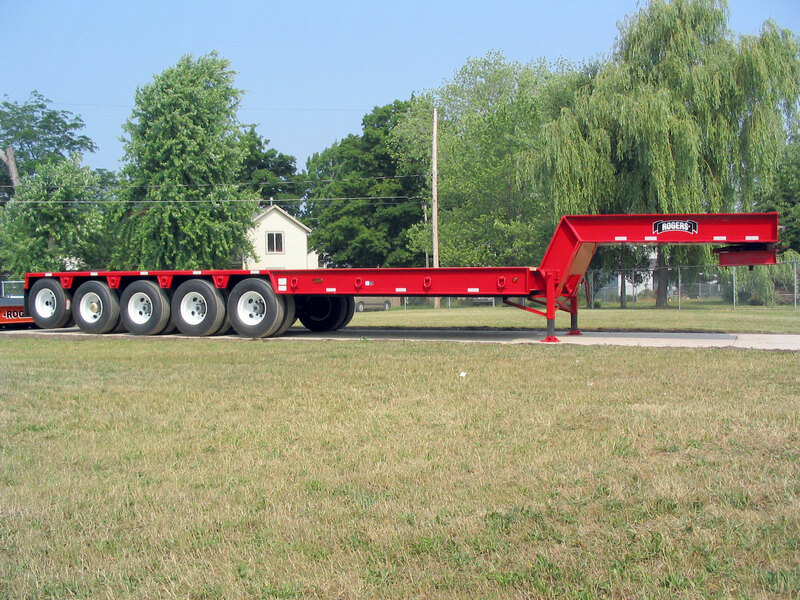 This fixed gooseneck trailer is designed to carry a crane-loaded concentrated load. The trailer features a 120,000 lb. capacity spring/walking beam suspension and a 5th axle air lift with 30,000 lb. capacity air ride suspension. The gooseneck is designed with a 104" swing clearance and 64" fifth wheel height, and is equipped with heavy-duty two-speed landing legs. A special "hat box" under the gooseneck is used for transporting this trailer to the customer. The main deck has 1/2" steel plate over the tires and oak boards over the rest of the deck. When the trailer is not loaded, the air lift on the 5th axle raises the tire 3" to 4" off the road to save on fuel and tire wear. The trailer uses large main beams fabricated out of 100,000 lb. minimum yield steel and extra deep cross members to carry the load with less tare weight.